We call this snack at home as Chekkalu(Telugu name) but it is very well know for its Tamil Name - Thattai. It is nothing but a flat rice savory crackers deep fried in oil which is mostly prepared during the festival seasons in India. A week before Diwali festival, I thought of preparing thattai as one my Diwali snacks and I called my granny to get notes of it. She suggested me few versions. After checking the availability of the ingredients for all versions, I chose this version as I found it was easy. I had helped my granny many times to make thattai but this was the first time I prepared it without anyone's help. Though this version sounds easy, It needs quite a lot patience to make perfect shaped thattai and it is again depending on how better you make the dough. So, while making dough take care at each step when you add water. 1) Combine all the ingredients except water and oil in a mixing bowl. 2) Heat water and add to the mixing bowl little at a time till you form a smooth dough. See to the salt and spicy and adjust accordingly. The temperature of water should be above luke warm and below the boiling point. 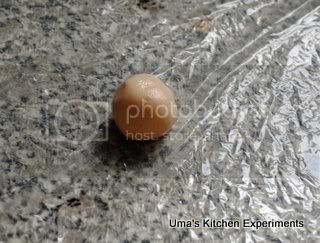 3) Divide the dough into small size (approx 1 inch) balls. Place the ball in oil coated ziploc bag or cling wrap or any food wrap. Press in evenly with your fingers to form round shape. Below are few other methods that you can try to make thattai. Choose any one to which you are comfortable. 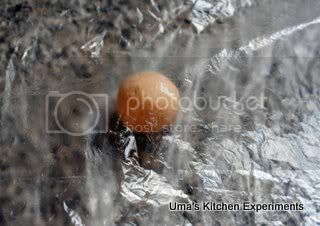 (3a) After placing the ball in oil coated Ziploc bag, place another Ziploc bag above it(I used large cling wrap and in one corner placed the ball and used the other corner to cover it) and press it evenly using a flat 2-3 inch diameter cap of container. (I used Nutella bottle's cap) This way you can get a even, round shape. (3b) Roll like chappathi and cut them into round shape using a cookie cutter. But for this version, It is little difficult to do this method. 4) Once you made the thattais, place them in a clean white damp cloth or in a newspaper. 5) Now heat oil in a wide pan. check the oil temperature by dropping a very small pinch of dough. If it comes out to the surface of the oil, drop the thattais one by one and deep fry them in a batch. At a time you can add 4-5 thattais. Fry it in medium temperature for best results. 6) When the thattai turns to golden brown remove from oil and place in the bowl containing a paper towel to absorb the excess oil. 7) Cool to room temperature and store in a air tight container. It can be stored upto 2-3 weeks. 1) If you are not getting round shape, don't worry but make sure you are getting some shape and able to place in the oil without breaking it. If it breaks, the dough is not in the correct consistency. 2) Increase the channa dal quantity to your personal preference. 3) Adding hot oil instead of butter will make the thattai to absorb less oil while deep frying. Delicious crispy ones!! Love with a cup of tea, love your clicks very creative!! I had an award waiting for you at my space 4 days back, did you collect it dear:-))?? I absolutely love them Uma with a hot cup of tea. I can see how crispy are they from your clicks. Love these crispy snack....yum...Lovely clicks..
very yummy and crispy snack !! Perfect rounds..Sometime I find the ones we do curl up at the ends..Yours look so perfect & too tempting!! Perfect shape delciious looking n looks too good..
All time favorite snack .. looks yummy. Crispy n yummy snack,nice presentation. delicious and crispy snack,we make it slightly different,your version sounds good.An award is waiting for you,stop by at my space. Prefect looking thattais, super tempting and addictive.. Simply delicious and crispy looking thattais. These look very delicious and I'm curious to make them, but what do you mean by "Heat water and add to the mixing bowl"? To a boil or just to a body temperature? Rice crackers look very crispy and yummy. Nice recipe and you have explained very well. Love to try this soon. Thanks for sharing dear. Bookmarked. Ha..the thattai looks so crisp and yumm..Perfect tea time snack. yours looks so thin n crisp..again will try this with your guidelines n let u know...nice clicks Uma!! Your blog is very interesting! I will follow ! Who can resist such crispy ones...yumm yumm..
perfect and delicious thattai..crispy ones..
@Mushitza, Thanks for stopping by, the water temperature should be below boiling point and above the luke warm. Also, if you add hot oil(not boiling) instead of butter it will help to less absorbtion of oil while deep frying. wow! !so crispy & easy to make snack! !want to give it a try!! Crispy crunchy thattais :) Beautiful clicks! I have never even thought about making rice crackers at home! This sounds perfect! I tried this today. It came out well, we enjoyed crispy thattais. Thanks a lot,Uma ! - Celina.